"...when you have four or five people within a block of each other, in one place, dying of cancer, it's just too much of a coincidence." It's not hyperbole to say that there are few topics more fraught than nuclear energy. Discussions conjure images of Three-Mile Island and Chernobyl, of mushroom clouds and radiation scarred children fleeing Nagasaki. Many with strong environmental concerns, on the other hand, see its clean power as our best hope for saving the planet. There is money to be made by those at the top of the industry, and jobs for those at the bottom. A nation like ours, with an insatiable appetite for energy, has found the perils and the promises impossible to ignore. Things were just a bit different at the beginning of the 1990s, where the issue was less energy than defense. While we've been lulled into a dangerously false sense of security with regard to nuclear weapons, in those days the dangers of the bomb were front and center. This Academy Award-nominated film by Mark Mori and Susan J. Robinson takes us to the company town of Aiken, Georgia. The company was Du Pont (and later, Westinghouse), and the business was bombs: the Savannah River Plant, built in the 1950s, was not only a huge employer but also the nation's largest manufacturer of nuclear bombs. The power of Building Bombs is in its straightforward manner. The message isn't shouted to the heavens. It's willfully understated by the filmmakers, and by narrator Jane Alexander. The story told is about the very real fallout from nuclear bombs: contaminated water sources, rare blood diseases, nuclear waste stored in cardboard boxes, even radioactive turtles left to wander through neighboring farms. It's clear that there was (and still is) a general lack of understanding about the specific dangers from low-level radioactive contamination, and a lack of clarity about safe ways to store and process waste. The filmmakers interview politicians, but also everyday plant workers, retired scientists, and a former plant waste management engineer whose report on dangers to the local water supply, and one of the country's largest aquifers, located nearby. What goes on looks at the plant doesn't look that different from what goes on in almost every workplace in the country: standard corporate cost-cutting, and employees compensating by ignoring problems. Anyone who's lived in a small industry town knows the extent to which a single company can call the shots, and the extent to which people will bend over backward to sweep problems under the rug. There's no choice: food on the table will always beat abstract concerns, and that's just fine by executives and politicians (like former Secretary of Energy James Edwards, who makes clear that the only thing we really need to fear is the environmental movement). The stakes, of course, are much higher than in a typical factory. The filmmakers take us through all this with a calmness that seems almost like mockery in the face of the issues they're discussing, but it works because nothing ever feels like hyperbole: just normal people telling their stories, and scientists laying out the facts. The story may seem to lack relevance for having taken place twenty years ago (and covering history that goes back to the 50s). The reactors at the Savannah River Site have been shut down for some time, and now it serves as a waste storage facility. I think what's clear, though, is that this is a story that repeats itself every generation, from The Jungle, to Silent Spring, and many others before and after. Somewhere, there's a corporation looking to save money, and people that will pay the price for carelessness and greed. The clean-up costs at the site ran to the tens of millions of dollars, while the true costs of the health impacts to employees and local residents may never be known. Taxpayer money is now going to a private consortium that will, beginning in 2016, process and dispose of some of the nation's surplus weapons-grade plutonium at Savannah River, the bulk of which was generated at the site. Image Transfer Review: Actually, quite nice. The low-budget documentary material combined with archival footage doesn't always make for the best source, but the transfer seems to reproduce the material faithfully. Audio Transfer Review: The Dolby 2.0 mix isn't flashy, but the narration and dialogue all come through clearly. Extras Review: Though an update on the Savannah River Site would have been appreciated, and subtitles would have been appreciated, there are a few modest but nice extras included:Michael Stipe Speaks Out is a brief introduction to the film from the R.E.M. front man, presumably from a film festival screening during the 90s. PBS Censorship Controversy is a short (roughly 15-minute) piece from a small (local?) independent film talk show with co-director Mark Mori, discussing the film in general, and specifically the initial refusal by PBS to air the film. 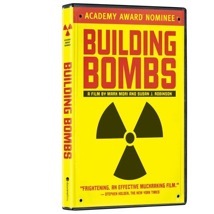 PBS felt that the film didn't give adequate representation to the pro-nuclear weapons side of the debate. After much media coverage, they relented, and relinquished their right to censor the film. There are two Filmmaker Interviews, running 31 minutes in total, one with each of the directors. They don't add a great deal to the film, but it's interesting how two (essentially) talented amateurs were able to make such a successful film. The Rare DOE/Atomic Energy Commission Films are probably the highlight of the extras. We've all seen similar material: training videos, and what are essentially commercials designed to "sell" the Savannah River Site. Creepy and historically fascinating.Finally, a Photo Gallery, text Filmmaker Biographies, and the Theatrical Trailer are included. It's not a new story: a new industry moves in, promising jobs and prosperity. Everything seems great, of course, until the land and people are used up and spent. In the case of Building Bombs it's the corporate makers of nuclear weapons that leave waste, cancer, and even radioactive turtles in their wake. This documentary may seem to lack relevance for having been created almost twenty years ago, but stories like those of the Savannah River Plant will keep repeating themselves until we begin to pay attention.